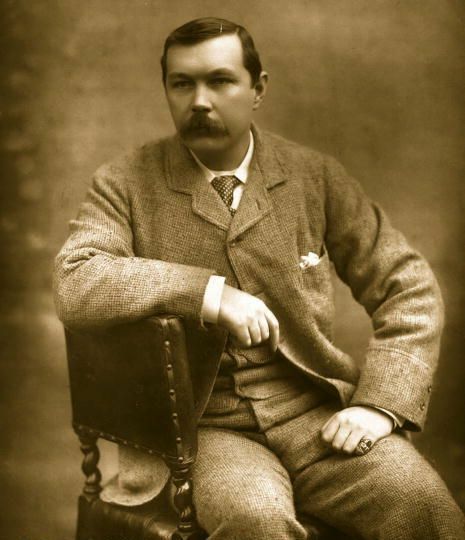 Sir Arthur Conan Doyle in 1890. Public domain image courtesy of Wikimedia Commons. For the next little while, I’m keeping a promise I made to some other bloggers during the #bookbloggers tweetchat. (You can find it at 2 p.m. EST Tuesdays using the handle @BookBloggersChat.) Please join me when you get time — I appear to be the only Yank so far! We’ve discussed different types of books and made recommendations to each other, so I promised to read some Enid Blyton (classic British children’s author) and Sir Arthur Conan Doyle’s Sherlock Holmes. For good measure, I threw in some Dashiell Hammett (the author of The Maltese Falcon, The Thin Man and The Glass Key). The Enid Blytons were good. I’m following the adventures of The Adventurous Four: Tom, Pippa, Zoe and Andy. They struck me as a cross between The Boxcar Children and the Scooby-Doo gang (without the dog). A lot of stuff happens to these kids, even accidentally, but they’re capable and resourceful children with long-suffering but patient parents. I read The Maltese Falcon, but I couldn’t really get into the characters all that much. (*ducks to avoid loyal Sam Spade/Humphrey Bogart fans*) Maybe it’s because I’m all too aware of the movie clichés involved with this type of novel: loyal secretary, hard-bitten detective with a convenient bottle of alcohol stashed in a desk drawer, dangerous femme fatale and dastardly villains with cheesy lines. How’s that for a visual? Sam Spade in hot pursuit of a giraffe…boggles the mind, doesn’t it? I haven’t seen the Humphrey Bogart movie, but one of these days…maybe I’ll like the movie better than the book. I have hopes for The Thin Man and The Glass Key. I look forward to reading Sherlock Holmes when I get a chance. I’m liking the Benedict Cumberbatch version of Sherlock, so I’m interested to see how the book version compares to the actor’s portrayal of the character. We’ll see.